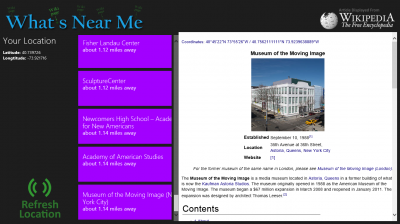 Get the App in the Windows 8 Store! Note: Since the app communicates with Wikilocation and Wikipedia, it must have an internet connection. And since it collects articles based on your location, it also must have the Location permissions approved. You may opt-out in the settings, but the app will not work without them. What’s Near Me does not collect or publish any personal information. It does require both Intenet Connection and Location service, but those are required to collect the Wikipedia articles. They are not collected or stored anywhere by this app! This app requests the use of your location in order to find Wikipedia articles that are Geotagged near you. You can opt-out of the Location service in the settings. However, the app will not work properly without it. This app requests the use of an internet connection in order to load the Wikipedia articles. No personal details are collected during these transactions. If you would like to report any violations of this policy, please contact me with details and I will take care of it immediately! 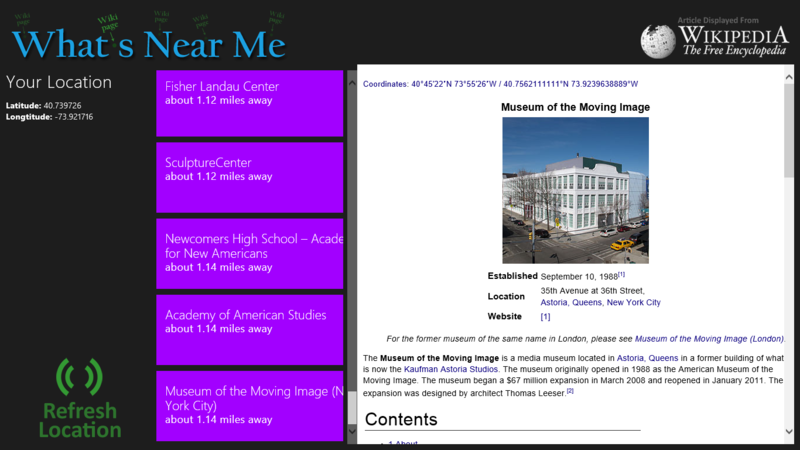 The app uses Wikilocation to find nearby articles, and Wikipedia to extract the article contents. Keep Wikipedia running, consider a donation to the Wikimedia Foundation!